2215 That Part 8 of Bylaw 2132, being the Municipal District of Provost No. 52 Municipal Development Plan, be amended by adding Wind Energy. The purpose of this Bylaw is to regulate and control the use and development of land and buildings within the municipality to facilitate the orderly and economic development of the Municipal District of Provost No. 52. ACCESSORY BUILDING or USE means a building or use, separate and subordinate to the principal building or use. ACT means the Municipal Government Act S.A.1994 Ch. M-26.1, as amended. is permitted pursuant to the Municipal Government Act. the application of fertilizers, manure, insecticides, pesticides, fungicides, and herbicides, including application by ground and aerial spraying, for agricultural purposes. AGRI-TOURISM OPERATION means the use of land and / or buildings for activities that combine tourism and agriculture, and for which a fee is normally charged. Agri-tourism operations may include, but are not limited to, country vacations, farm tours, market gardens, and trail riding. AIRPORT means an area of land or water, including the frozen surface thereof, or other supporting surfaces used or intended to be used either in whole or in part for the arrival and departure or servicing of aircraft and includes any building, installation, or equipment in connection therewith for which an airport license has been issued by the Ministry of Transport. AIRPORT ZONING REFERENCE POINT ELEVATION, in the case of airports, means 662.6 metres (2,173.9 ft) above sea level and is used to determine the outer surface. BASIC STRIP, in the case of airports, means a rectangular area measured as 75 metres (250 ft.) on each side of the centre line of the runaway and with a total length of 1526 metres (5035 ft.). BED AND BREAKFAST ESTABLISHMENT means a lodging facility within an owner- occupied dwelling that complies with the Alberta Building Code’s definition of a “Boarding and Lodging House”. CONFINED FEEDING OPERATION means an activity on land that is fenced or enclosed or within buildings where livestock are confined for the purpose of growing, sustaining, finishing, or breeding by means other than grazing, but does not include seasonal feeding and bedding sites. CORNER PARCEL means a parcel having frontage on two streets at their intersection. COTTAGE means a one family dwelling not intended for year round occupation, and is associated primarily with recreational or leisure use. COUNCIL means the Council of the Municipal District of Provost No. 52. COUNTRY RESIDENTIAL means a detached dwelling or manufactured home situated on a parcel of land used principally for private residential purposes within an otherwise rural or agricultural area. a change in the intensity of use of land or a building. Development includes shelter belts and improvements or additions to existing buildings. DEVELOPMENT OFFICER means a person appointed to the position of Development Officer by resolution of Council, pursuant to this Bylaw. DEVELOPMENT PERMIT means a document authorizing a development issued pursuant to this Bylaw. DISCRETIONARY USE means the use of land or a building which is considered on its individual merits and circumstances by the Development Authority and for which a development permit may or may not be issued at the discretion of the Development Authority. DWELLING, DUPLEX means a building, other than a manufactured home, that consists of two dwelling units sharing a common wall, and located side by side or one above the other, and each unit has a separate entrance to grade level. DWELLING, DETACHED means a building, other than a manufactured home, that consists of one dwelling unit. DWELLING UNIT means self-contained living premises with sleeping, cooking and sanitation facilities, and intended as a permanent residence. EXTENSIVE AGRICULTURE means the cultivation of land and raising of livestock, but does not include confined feeding operations, as defined by the Agricultural Operation Practices Act. Extensive agriculture does not include the farmstead, residences, and accessory buildings. FARMSTEAD means improvements used for extensive agriculture (barns, corrals, grain bins, etc. ), situated on land for use with such operations. The term “farmstead” does not include the residences, whether they are detached dwellings or manufactured homes. FLOODPLAIN means land calculated or determined to be located within the 1:100 year floodplain risk area or a water course, as defined by Alberta Environment. FLOOR AREA means the total floor area of every room and passageway contained in a building, not including the floor areas of basements, attached garages, sheds, open porches, patios, open decks, verandahs or breezeways. FRONT YARD means a yard extending across the full width of a parcel from the front line of the parcel to the front wall of the main building situated on the parcel and the front yard, where the parcel is a corner parcel fronting onto two roads, shall be decided by the Development Authority. HEAVY TRUCK AND EQUIPMENT STORAGE means the on-lot storage of heavy trucks and equipment owned and operated by those residing on the lot. HEIGHT means the highest point of the roof above grade level, when used with reference to buildings and structures. HOME OCCUPATION means any trade, business, profession or occupation carried out in a dwelling unit or accessory building, which is secondary to the primary use. Home occupations do not include the employment of individuals who reside outside of the residence of the owner-occupier. Home occupations do not include hobbies. LANE means a public roadway usually less than 10 metres (32.8 ft) wide providing secondary access to one or more parcels. LIVESTOCK means cattle, horse, sheep, goats, swine, or fowl and other types of agricultural animals. MANUFACTURED HOME means a structure whether ordinarily equipped with wheels or not, that is manufactured to be moved from one point to another by being towed or carried, and which provides year round living accommodation for one or more persons, and can be connected to utilities. MUNICIPAL PLANNING COMMISSION means the Municipal Planning Commission established by Council pursuant to the Municipal Government Act. MUNICIPALITY means the Municipal District of Provost No. 52. NATURAL RESOURCE EXTRACTIVE INDUSTRY means those uses which are related to natural resource development and include, but are not limited to the following: oil, sulphate, coal, gas, gravel. that on the date this Bylaw or any amendment thereof becomes effective does not, or when constructed will not, comply with this Bylaw. that on the date this Bylaw or any amendment thereof becomes effective does not, or in the case of a building under construction will not, comply with this Bylaw. OUTER SURFACE, in the case of airports, means an imaginary common plane established at a constant elevation of 45 metres (150 ft.) above the airport zoning reference point elevation and extending to the boundary of the “AV” – Airport Vicinity District and the “AF” – Airport Fringe District. PARCEL means the aggregate of the one or more areas of land described in a certificate of title or described in a certificate of title by reference to a plan filed or registered in a land title office. PERMITTED USE means the use of land or a building for which a development permit shall be issued provided the proposed development conforms with all regulations of this Bylaw. PRINCIPAL BUILDING means a building in which is conducted the main or principle use of the site on which it is erected. PRINCIPAL USE means the main purpose for which a parcel is used. REAR YARD means a yard extending across the full width of the parcel from the rear wall of the main building situated on the parcel to the rear line of the parcel. RURAL SMALL HOLDING means a non-agricultural lot within an extensive agricultural quarter section intended to provide sufficient land, and separation from neighbours as well as the adjacent urban area, to accommodate a detached dwelling or manufactured home, related on-site services, vehicle garage, and shop(s)/yard space for heavy truck and equipment storage as a subordinate use. SEASONAL FEEDING AND BEDDING SITE means an over-wintering site where livestock are fed and sheltered. SIDE YARD means a yard extending from the front wall of the main building situated on a parcel to the rear wall of the main building, and lying between the side line of the parcel and the side wall of the main building. SIGN means a device or structure for providing direction or providing information or calling attention to such things as a development, business, produce, service, location, object, event or person. a part of a parcel where the boundaries of the part of described in a certificate of title by reference to a plan of subdivision. SUBDIVISION AND DEVELOPMENT APPEAL BOARD means a subdivision and development appeal board appointed pursuant to the Municipal Government Act. SUBDIVISION APPROVAL AUTHORITY means an agency or individual appointed by Council by Bylaw to review and decide on subdivision applications. that ends at its intersection with the outer surface. TEMPORARY means a period of time up to one (1) year. ends at its intersection with the outer surface and the take-off / approach surfaces. systems for telephone and cable TV distribution. All other words and phrases mean the same as they do in the Municipal Government Act. The Development Authority is hereby established for the purpose of exercising development powers and duties on behalf of the Municipality. the Municipal Planning Commission while exercising development powers or duties under this Bylaw or the Municipal Government Act. The position of Development Officer is hereby established and shall be filled by a person or persons appointed by resolution of Council. refer to the Municipal Planning Commission any application for a development permit which in his/her opinion should be decided by the Municipal Planning Commission. The Municipal Planning Commission is hereby established and shall be filled by persons appointed by resolution of Council. decide on any application referred to it by the Development Officer. No person who is a member of the Subdivision and Development Appeal Board shall be appointed to act as a member of the Municipal Planning Commission. The Municipal Planning Commission may make orders, decisions, development permits and approvals and issue notices with or without conditions. No development other than that designated in Section 7 shall be undertaken within the municipality unless an application for it has been approved and a development permit has been issued. The carrying out of works of maintenance or repair to any building, including interior renovations, provided such works do not include structural alterations or major works of renovation that would effect changes in exterior design. A temporary building, the sole purpose of which is incidental to the erection or alteration of a building for which a development permit has been issued, and which is removed from the site upon completion of construction/alteration. The construction of one accessory building on a parcel located in a Hamlet or Country Residential (CR) District provided the accessory building is no greater than 3 m by 4 m (10 x 12 ft.) and meets the setback standards of the relevant land use district. The maintenance and repair of public works, services and utilities carried out by or on behalf of Federal, Provincial, Municipal, or public authorities on land which is publicly owned or controlled. The construction, maintenance and repair of private walkways, pathways, driveways and other similar works. The erection or construction of solid or non-wire fences, gates, walls, shelter belts and other means of enclosure, subject to the setback requirements outlined in the General Land Use Regulations. The erection of wire fences, or other fence structures that do not limit visibility, at the discretion of the Development Officer, do not require a permit and shall be exempt from the setback provisions of this Bylaw. The erection and construction of decks attached to residential buildings, subject to the restrictions outlined in the General Land Use Regulations and to the setback restrictions outlined in the relevant Land Use District. Extensive agricultural operations (except in the Airport Vicinity Protection Area where development permits are required). The use of a building or part thereof as a temporary polling station for a Federal, Provincial, or Municipal election, referendum or plebiscite. complies with any development permit issued for it. The use of building mentioned in subsection (12) for the purpose for which construction was started. a development permit fee as established by resolution of Council. Prior to accepting an application for a development permit, the Development Authority may require the applicant to conduct a public meeting. refuse the permit application, stating reasons for the refusal. In the case where a proposed specific use of land or a building is not provided for in any land use district in this Bylaw, the Development Authority may determine that the use is similar in character and purpose to another use of land or building that is included in the list of permitted and discretionary uses prescribed for that Land Use District. the proposed development conforms with the use prescribed for that land or building in this Bylaw. As part of a development permit application or subdivision application, the Development Authority may request that the applicant enter into a development agreement in accordance with the Municipal Government Act. An application for a development permit shall, at the option of the applicant, be deemed to be refused when a decision is not made on it by the Development Authority within 40 days after receipt of the application in its complete and final form by the Development Authority. If a development permit application is refused, the Development Authority need not accept another application for the same or similar use on the same parcel for six months after the date of refusal. A development permit issued pursuant to this Section for a permitted use where no provisions of this Bylaw have been relaxed or varied, is effective upon the decision being communicated to the applicant. A permit granted pursuant to this Section for a discretionary use as listed in a Land Use District, does not come into effect until 14 days after the decision is communicated to the applicant. When an appeal is made pursuant to this Bylaw, a development permit that has been granted shall not come into effect until the appeal has been determined and the permit is affirmed, modified or nullified thereby. In the case of a permitted use where the standards and provisions of this Bylaw have not been relaxed or varied, no notification of adjacent or affected land owners is required. In all other cases, a notice shall be immediately published in a newspaper circulating in the Municipality stating the location of the property for which the application has been made and the use approved, and a notice in writing may be mailed to the applicant and to all adjacent land owners. If the development authorized by a permit is not commenced within 12 months from the date of its issue, the permit is deemed to be void, unless an extension to this period is granted by the Development Authority. A decision by the Development Authority on an application for a development permit shall be given in writing and a copy of it sent to the applicant within 14 days from the date of notice. When the Development Authority refuses an application for a development permit, the decision shall contain reasons for the refusal. the development permit was issued in error; the development permit may be suspended or cancelled by notice in writing, issued by the Development Authority to the applicant to the address given in the development permit application. cancels or suspends a development permit pursuant to this Bylaw. Notwithstanding subsection (1), no appeal is allowed in respect of the issuance of a development permit for a permitted use listed in a Land Use District, unless the provisions of this Bylaw were relaxed, varied or misinterpreted. The person applying for a permit or affected by an order, or any other person affected by an order, decision or development permit, may appeal to the Subdivision and Development Appeal Board. first published in a newspaper circulating in the area, for everyone other than the applicant. Within 30 days of receipt of a notice of appeal, the Subdivision and Development Appeal Board shall hold a public hearing respecting the appeal. to those adjacent land owners who were notified by mail and any other person who in the opinion of the Board, is affected by the order, decision or permit. the Order of the Development Authority, as the case may be. any other person who claims to be affected by the order, decision or permit and that the Subdivision and Development Appeal Board agrees to hear, or a person acting on his or her behalf. The Subdivision and Development Appeal Board shall give its decision in writing together with reasons for that decision, within 15 days of the conclusion of the public hearing. A decision made under this part of this Bylaw is final and binding on all parties, and subject only to appeal upon a question of jurisdiction or law pursuant to the Municipal Government Act. within the time set out in the notice. A person who receives a notice pursuant to this Bylaw may appeal to the Subdivision and Development Appeal Board in accordance with the Municipal Government Act and this Bylaw. If a person fails or refuses to comply with an order directed to him or her, the Council or a person appointed by it may, in accordance with the Municipal Government Act, enter on the land or building and take any action necessary to carry out the order. forms a special lien against the parcel of land in favour of the municipality from the date it was added to the tax roll. A person may apply to have this Bylaw amended, by applying in writing and providing reasons in support of the application. Council may at any time initiate an amendment to this Bylaw by directing the Development Officer to initiate an application therefore. An application to amend this Bylaw shall be accompanied by a fee established by resolution of Council. Where an application is considered to be for the greater public interest, Council may waive or refund the established fee. If an application to amend this Bylaw is refused by Council, then Council need not accept another application for an amendment for the same use of land on the same parcel for a period of six (6) months from the date of the refusal. any documents as required by the Development Authority. All amendments to this Bylaw shall be in conformance with the Municipal Government Act. A development requiring subdivision of land shall not be issued a development permit until such time as subdivision approval has been received from the subdivision approval authority, or upon appeal from the Subdivision and Development Appeal Board or the Municipal Government Board. the parcel of land is greater than 20 acres and is in the “AD” – Agricultural District. A non-conforming use of land or a building may be continued but if that use is discontinued for a period of six consecutive months or more, any future use of the land or building shall conform with the provisions of the Land Use Bylaw in effect. A non-conforming use of part of a building may be extended throughout the building but the building, whether or not it is a non-complying building, shall not be enlarged or added to and no structural alterations shall be made thereto or therein. A non-conforming use of part of a lot shall not be extended or transferred in whole or in part to any other part of the lot and no additional buildings shall be erected upon the lot while the non-conforming use continues. if, at the discretion of the Municipal Planning Commission, the alterations do not increase the extent of non-conformance and are within all other requirements of this Bylaw, the development may be permitted. If a non-conforming building is damaged or destroyed to the extent of more than 75% of the value of the building above its foundation, the building shall not be repaired or rebuilt except in accordance with the Land Use Bylaw. The use of land or the use of a building is not affected by reason only of a change of ownership, tenancy or occupancy of the land or building. The location of anhydrous ammonia storage tanks shall be in accordance with the requirements of the Development Authority, who may evaluate such development proposals based on Alberta Environment’s guidelines for the location of stationary bulk ammonia storage facilities. Flammable liquids storage tanks at bulk fuel plants, service stations or other similar facilities shall be located to the satisfaction of the Development Authority in accordance with the regulations under the Fire Prevention Act. Setbacks from pipelines and other utility corridors shall be at the discretion of the Development Authority, in accordance with relevant Provincial or Federal Regulations and Acts. All development permit applications in the rural fringe area will be circulated to the relevant rural municipality for comments and recommendations, prior to a decision being made. 40 m (125 ft) for municipal roads. As required by Alberta Transportation in the case of provincial highways. 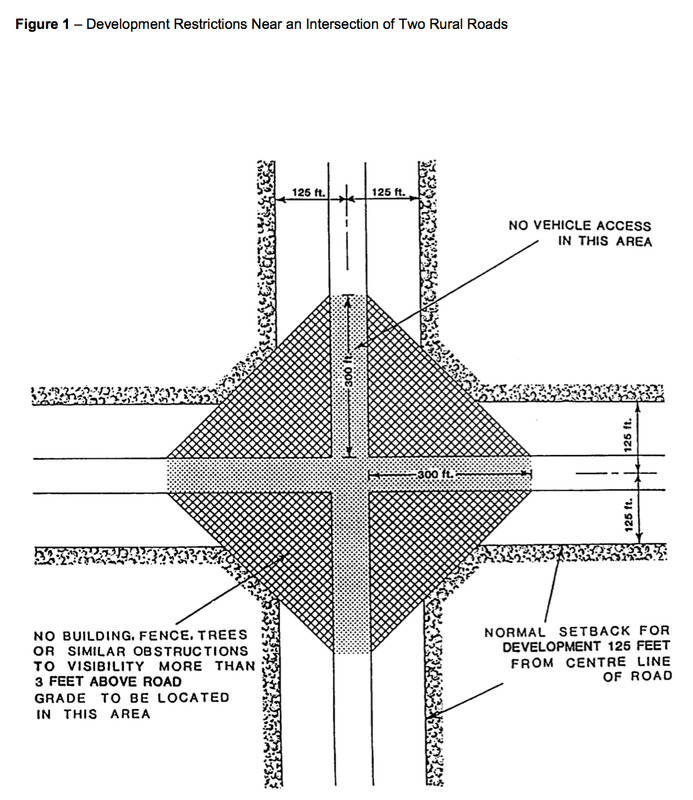 The required development and building setbacks from roadways are included as Figures 1 and 2. Shelter belts, tree plantings, solid fences, hedges and other means of enclosure greater than 1 m (3 feet) in height are subject to the setback requirements shown in Figures 1 and 2. Wire fences or other fence structures that do not limit visibility shall be exempt from the setback provisions of this Bylaw. If a development permit application is made for a development whose highest point will penetrate the outer surface, the Development Authority shall send a copy of the application to the Department of Municipal Affairs for comment. Any new development within the Airport Vicinity Protection Area as shown on Map 13 shall not be permitted if, in the opinion of the Development Authority, it generates a large amount of smoke, dust, or attracts birds, or any other use which may be in conflict with the airport. 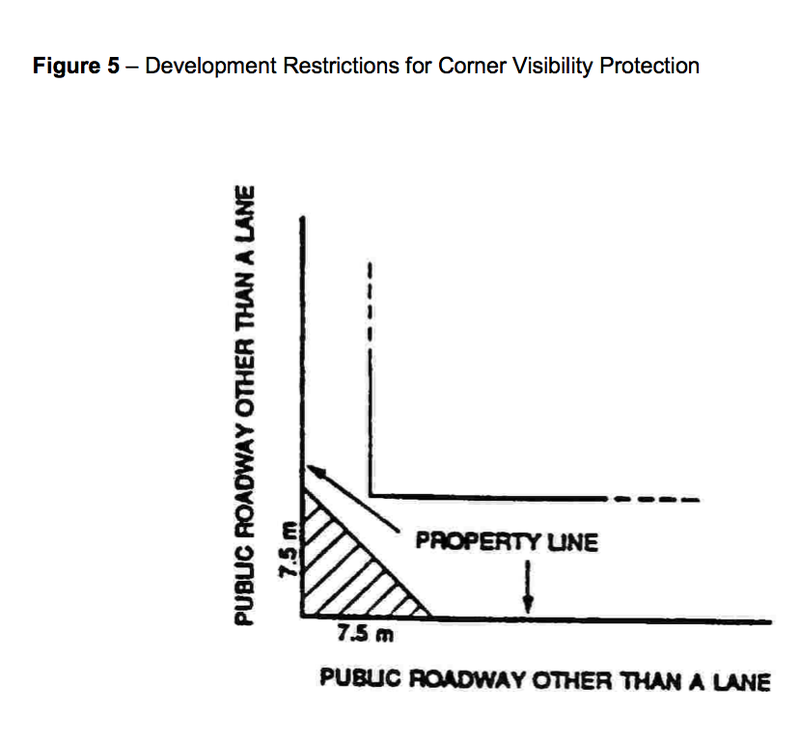 for the development of a roadway or highway, the highest point of the development shall be deemed to be 4 metres higher than the centre line of the roadway. Subdivision of land within the area defined as the Airport Vicinity Protection Area as displayed on Map 13 may not be allowed if, in the opinion of the Municipal Planning Commission, development of the resultant parcels increases the potential for conflict with the airport facilities or if the size of the parcels is not suitable for any of the potential uses in this district. Land within 1:100 year floodplain (as determined by Alberta Environment) shall not be developed unless sufficient landfill can be provided to raise the area at least one metre (3 ft) above the flood level, or other suitable flood proofing techniques are employed to the satisfaction of the Development Authority. all mechanical and electrical equipment is located above the 1:100 year floodplain. No part of any residential building should be within 40 m (125 ft.) of a river, lake, stream, or other permanent water body, unless otherwise allowed within an approved Area Structure Plan or other statutory document. the parcel may be set back an appropriate distance from the high water mark in order that public access can be provided through the dedication of Environmental Reserve. In the case of development permit applications on existing parcels, the Development Authority may relax subsection (1) and (2). Figure 4 illustrates the terms defined in this subsection. slopes greater than 15% may require special engineering or other treatment to be developed. the contours, leveling, compaction, and other engineering and environmental aspects shall be satisfactory to the Development Authority and other relevant authorities. Protrusions wider than 90 m (300 ft) at their widest point shall not be removed. Removed or leveled protrusions shall result in slopes of no more than 33%. 40 m (125 ft) where the slope height exceeds 23 m (75 ft). a distance which is deemed sufficient by a geotechnical report performed by a professional engineer. All development shall be in general conformity with adjacent developments. The siting and landscaping of all parcels shall be to the satisfaction of the Development Authority. In Hamlet Districts, the design, external finish, and architectural appearance of all buildings, including accessory structures and signs, shall be similar to and complement the existing structures on parcels adjacent to the parcel onto which the building / structure is to be located. parcel size is kept as small as possible while including buildings, shelterbelts, corrals, wells and septic systems. Preferably not greater than 10 acres (4.0 ha). Parcel sizes greater than 10 acres will be allowed only to encompass such items as water wells, shelter belts, septic systems, and accessory farm structures. the remnant of the quarter section has access to an opened public road. Rural residential subdivisions may not be allowed where potential conflicts with adjacent or surrounding agricultural land uses would result. The Development Authority may consider additional rural residential subdivisions based on the merits of each application. A structure which is attached to the principal building by a roof, a floor or a foundation is considered a part of the principal building. An accessory building shall be located at least 2 m (6 ft) from any principal building. An accessory building shall not be used as a dwelling. The total combined floor area of an accessory building shall not exceed 15% of the site area. All development permits issued for home occupations shall be revocable at any time by the Development Authority if in their opinion, the use is or has become detrimental to the amenities of the neighbourhood. The process of revocation shall be in accordance with the Municipal Government Act. The Development Authority may issue a temporary permit for a home occupation. A home occupation shall not include any use or operations which will cause or create a nuisance by way of undue dust, noise, smell, smoke or traffic generation. In hamlets and the “CR” – Country Residential District, a home occupation shall be confined to the residence or accessory buildings and be subordinate to the residential use and shall be limited to those uses which do not interfere with the rights of adjacent residents. The Development Authority may permit limited outside storage, if it is determined, the outside storage will not effect neighbouring properties and can be screened from view. In hamlets and the “CR” – Country Residential District, signage for a home occupation is restricted to one sign per site attached to the building with a maximum size of 1 m2 (10 sq. ft). Appearance of the sign shall be of a professional quality to the satisfaction of the Development Authority. In the agricultural districts, a home occupation shall be confined to the residence or farmyard site and subordinate to the principal use of the site for agricultural and residential purposes. Further, in this district, limited outside storage of materials, goods or equipment may be permitted. portable fire extinguisher required for each level of building. Off-street parking shall be provided with a minimum of one stall per owner plus one stall per guest room. Access to a public lane or street shall be to the satisfaction of the Development Authority. Signing is restricted to one sign per site attached to the building with a maximum size of 1m2 (10 sq. ft.). Appearance of the sign shall be of a professional quality to the satisfaction of the Development Authority. All development permits issued for bed and breakfast establishments shall be revocable at any time by the Development Authority if in his/her/their opinion, the use is or has become detrimental to the amenities of the neighborhood. The Development Authority may issue a temporary permit for a bed and breakfast establishment. All manufactured homes shall comply with the Alberta Building Code. Manufactured homes shall have a foundation capable of supporting the maximum anticipated load of the manufactured home during all seasons without settlement or other movement. The undercarriage of each manufactured home shall be screened from view by the foundation or by skirting within 30 days of placement of the manufactured home. All manufactured homes within hamlets shall be serviced by municipal water and sewer services as available. The Development Authority may request that an application for a manufactured home be accompanied by a recent photograph of the structure, and wherever possible the Development Authority may inspect the structure. Where a development permit has been granted for the relocation of a building on the same site or from another site, the Development Authority may require the applicant to provide a Performance Bond or a letter of credit to ensure completion of any external renovations set out as a condition of approval of the permit. All external renovations to a relocated building are to be completed within one year of the issuance of the development permit. Prior to approving a development permit for a moved in building, the Development Authority may obtain the views in writing of the adjacent registered property owners within a minimum of 60 m (196 ft.). The Development Authority may request that an application to relocate a building or structure be accompanied by a recent photograph of the building/structure, and wherever possible the Development Authority may inspect the building/structure. In all hamlet, “CR” – Country Residential, and “LD” – Lake Districts, parcels shall be graded in such a manner that all surface water will drain from the building site to the back lane and/or front street. Surface water shall not drain onto adjacent parcels. The Development Authority may establish parcel and building elevations if it is felt that drainage from existing elevations will affect adjacent parcels. No sign or sign structure shall be erected without the prior consent of the registered owner and the occupant of the land in question. No sign or sign structure shall be erected where it may interfere with, obstruct or be confused with any authorized traffic sign, signal or device. No sign or sign structure shall be erected adjacent to a provincial highway without prior approval of Alberta Transportation. All signs and sign structures shall be kept in a safe and tidy condition or may be required to be renovated or removed by Council. All signs shall be sited to the satisfaction of the Development Authority. The following signs may be erected on any land or affixed to the exterior of any building without the need for a development permit. non-illuminated signs of local authorities, utility boards or other public or quasi- public bodies. Along provincial highways, shelterbelts and fences of at least 2 m (6 ft.) in height shall be set back as required by Alberta Transportation. Shelterbelts and fences of at least 2 m (6 ft.) in height shall be set back 40 m (125 ft.) from the centre line of all municipal roads, unless otherwise approved. The erection of wire fences, or other fence structures that do not limit visibility are exempt from subsection (2). Fencing in hamlets shall be constructed from material appropriate for the land use district in which the fence is located, and shall be in general conformity with adjacent dwellings. On corner lots within hamlets, no fence wall, tree, hedge, or other structure, object or plant exceeding 1 m (3 ft) in height shall be permitted in a corner visibility triangle as indicated in Figure 5. Agricultural land rated as Canadian Land Inventory (CLI) classes 1 to 4 shall be encouraged to be preserved for agricultural operations. utilize better quality agricultural land. Written notice may be provided to residents in the Municipality describing the nature of agricultural operations that exist within, or in close proximity to, the Municipality. All industrial and commercial subdivisions or developments should minimize agricultural land being removed from production. Industrial and commercial uses should not be located and designed to create conflicts with adjacent or surrounding land uses through unsightly appearance, emission of noise or pollutants, creation of dust and similar disturbances. Industrial and commercial uses shall have adequate sewage disposal systems and available water supplies as approved by the appropriate authorities. In addition to the development permit application requirements of Part 3 of this Bylaw, applications for development permits for industrial and commercial uses shall include information as outlined in Appendix “A”. A permanent water license shall be obtained BEFORE construction can begin, if a water source is required for the development. Unless otherwise specified in this Bylaw, parking requirements shall be at the discretion of the Development Authority. A parking space shall not be less than 15 m2 (160 sq. ft) in area and not less than 2.5m (8 ft.) wide. The Development Authority may consider the environmental impact of any proposed development. The Development Authority may refer the proposal to a relevant provincial department for comment on the nature of the environmental concern. Where a development is considered to have a significant environmental impact, the Development Authority may request the developer to have an environmental evaluation prepared and submitted by an appropriate professional, or undertake its own environmental evaluation regarding the proposed development. All costs associated with an environmental evaluation are the responsibility of the developer. BLADE means an element of a WECS rotor which acts as a single airfoil, thereby extracting kinetic energy directly from the wind. BLADE CLEARANCE means the distance from grade to the bottom of the rotor’s arc, in reference to a horizontal axis rotor. COMMENCMENT OF CONSTRUCTION means the moment any excavation has begun for the purposes of this section. HORIZONTAL AXIS ROTOR means a WECS where the rotor is mounted on an axis horizontal to the earth’s surface. POWER PLANT means a WECS used for the generation and gathering of electric energy from a wind source for the purposes of this section. ROTOR’S ARC means the largest circumferential path travelled by the WECS blade. SHADOW OR FLICKER means the repetitive moving shadows or reflection cast from the rotor blades as they pass through the sunlight. TOTAL HEIGHT means the height from grade to the highest vertical extension of the WECS. In the case of a WECS with a horizontal axis rotor, total height includes the distance from grade to the top of the tower, plus the distance from the top of the tower to the highest point of the rotor’s arc. TOWER means the structure that supports the wind turbine above grade. VERTICAL AXIS ROTOR means a WECS where the rotor is mounted on an axis perpendicular to the earth’s surface. VIEWSCAPE means the area visible form a point, a line, an arc, or specific locality that contain historic scenic value as deemed by Council to be worthy of preservation from development. WIND ENERGY CONVERSION SYSTEM – COMMERCIAL means a power plant consisting of one or more wind turbines and related facilities with a rated capacity of greater than 1 megawatt connected to the same substation or metering point used for the production of electrical power primarily for resale. The boundary of a WECS-Commercial development shall be defined by the legal boundaries of all titled parcels where the development has infrastructure proposed or located within. WIND ENERGY CONVERSION SYSTEM – MICROGENERATION means a single power plant consisting of a wind turbine and related facilities with a rated capacity of less than 1 megawatt, and which is intended to primarily provide electrical power for the on-site consumption requirements, either on or off-grid, and may provide residual power to the grid but is not intended to produce power primarily for resale. The boundary of a WECS – Microgeneration shall be the legal boundaries of the titled parcel where the wind turbine is located. WIND TURBINE means the components of a power plant that produce electrical energy and ancillary services including the rotor, generator and tail fixed on a tower. Any additional information deemed necessary by the development authority to make an informed decision. Tower height shall be in accordance with the manufacturer requirements and shall conform to the setback requirements below. The WECS – Microgeneration tower base shall be no closer to the property line than the total height of the WECS – Microgeneration, and no part of the tower structure, including guy wire anchors, may extend closer than 3 m (10 ft.) to the property boundaries of the site. The Development Authority may waive the tower base setback requirements if the adjacent property owner grants an easement for the location of the WECS – Microgeneration to be closer than these requirements. The WECS – Microgeneration tower base shall be no closer to a dwelling unit on an adjacent property than the total height of the WECS – Microgeneration. No variance or relaxation of this requirement is permitted. SoundSound levels from a WECS – Microgeneration shall not negatively impact adjacent property owners. A satisfactory report from a sound engineering professional may be required to ensure noise levels are not above that of normal ambient background noise on adjacent properties. This determination shall be measured at the at the property line of the parcel in a direct line between the WECS – Microgeneration and the dwelling. ViewscapeThe nature of a WECS – Microgeneration requires the installation of the turbine on a tall tower, 25-30 ft. above structures or trees, to reach wind conditions and avoid turbulence. Visual Impact concerns shall be considered where there is significant scenic or historical value associated and where there is a clear public benefit. Finish and AppearanceA WECS – Microgeneration shall be finished in a non-reflective matte and in a colour that minimizes any obtrusive impact to the satisfaction of the MPC. AdvertisingNo advertising shall appear on the tower, blades or turbine. Consultation RequirementsApplicants for a WECS – Microgeneration shall be responsible for circulating the proposal prior to application to adjacent property owners using the approved form. Any comments received from the circulation shall be included with the application. DecommissioningIf the active production of electricity from a WECS – Microgeneration is discontinued for two years or more the WECS – Microgeneration shall be removed. Upon termination of the use, the entire facility shall be removed and the site shall be restored to pre-construction condition. A separate WECS – Commercial development permit application shall be submitted for each titled parcel. An accurate site plan showing and labeling all relevant information including the specific location of each existing and proposed Wind Turbine including setbacks as defined in Section 40 (also to be provided in chart form), all associated substations, collection and transmission system on or abutting the subject lot or parcel, and contours of the land and access roads for the complete WECS – Commercial. An accurate plan showing the titled parcels and location of WECS – Commercial in each application. A digital database listing exact location and base elevation of each wind turbine in a format acceptable to the M.D. each accessible residence within 2 km (1.2 miles) of the WECS – Commercial boundaries. WECS – Commercial showing tower height, rotor diameter, colour and landscape. dimensions of tower and rotor. – at any habitable or occupied dwelling within 2 km (1.2 miles) of any WECS – Commercial. Any other approvals or requirements as determined necessary by the MPC. Wind Energy Conversion System – Commercial developments shall require reclassification to the Commercial Wind Energy ‘CWE’ Land Use District prior to acceptance of a development permit application. The applicant shall forward to the M.D. copies of all regulatory and utility permits, approvals, and conditions prior to commencement of construction. the development permit shall expire if the suspension period in (d) is not granted and any period described in (a), (b), (c), or (d) lapses. within 2 km (1.2 miles) of a developed Country Residential area, Hamlet, Town or Village boundary. Tower height shall be considered in accordance with the manufacturer and technical requirements for maximum efficiency and shall conform to the setback requirements below. From any municipal road allowance or property line – Total height plus ten (10) percent. Where no road allowance is located between property lines (whether both parcels are included within the same WECS – Commercial development boundary or the adjacent parcel is located outside of the development boundary – in accordance with Section (6)(a)(ii). Minimum setback requirements may be reduced with the agreement of the affected landowner and registration of an easement on the land title of the affected property. A WECS – Commercial tower base setback from a dwelling shall be a minimum distance of 1 kilometre unless a lesser distance is agreed to by the owner of the affected dwelling. If a lesser distance is agreed to by the owner of the affected dwelling the minimum setback shall not be less than that determined in accordance with the modeled sound level not exceeding 40dBA measured at a distance of 15m from the nearest or most impacted dwelling , and no closer to a dwelling on an adjacent property than the total height of the WECS – Commercial plus ten (10) percent. No variance or relaxation of this requirement is permitted. Any agreement between the owner of the affected dwelling and the developer shall be provided to the MPC as an attachment to the development permit application. Setback requirements may be considered by the MPC if necessary to reduce the impact of a WECS – Commercial on other structures. A locked device shall be installed on the tower to preclude access to the top of the tower. Tower of tubular construction with locked internal access will preclude the above requirements. The nature of a any WECS requires the installation of the turbine on a tall tower to reach the appropriate wind conditions and avoid turbulence. Visual Impact concerns shall be considered where there is significant scenic or historical value associated and where there is a clear public benefit. A WECS – Commercial tower shall be finished in a non-reflective matte and in a colour that minimizes any obtrusive impact to the satisfaction of the MPC. No advertising shall appear on the tower or blades. The turbine may contain the manufacturers and/ or owners identification only. Public meeting hosted and advertised by either general mail out or newspaper advertising at least two weeks in advance, with the applicant’s contact information provided. Adjacent landowners to proposed WECS sites must be notified in writing, with copies of the notice and a landowners list provided with application information. Information provided at meeting must address all points required in the development permit application requirements. Summary of consultation and feedback to be included with application as requested. All electrical transmission lines used to interconnect the towers and/ or substation facilities shall be underground installation unless otherwise approved by the MPC. Should a developer propose alteration or repowering of an existing WECS – Commercial development with changes from the original approval a new development permit application shall be required. If infill development (addition of wind towers) to an existing WECS – Commercial development a new development permit application shall be required. If the active production of electricity from a WECS – Commercial development is discontinued for two years or more the developer shall provide a report to the MPC stating the operations plan for the project. Decommissioning of the WECS – Commercial development may be required. Failure to comply with a decommissioning request from the municipality may result in the issuance of a stop work order by the designated officer in accordance with the provisions of the Municipal Government Act. The locations and boundaries of the land use districts are shown on the Land Use District Maps, which form Schedule A of this Bylaw. RULE 1. Where a boundary is shown as following a street, lane, stream or canal, it shall be deemed to follow the centre line thereof. RULE 2. Where a boundary is shown as approximately following a lot line, it shall be deemed to follow the lot line. where no dimensions are given, measurement using the scale shown on the map. with the appropriate degree of detail required. In the case of the water bodies, streams, rivers or other cases, the municipal boundary shall be as determined by Order in Council. The location of a district boundary, once fixed, shall not be altered except by an amendment of this Bylaw. The Council shall keep a list of its decisions fixing the locations of district boundaries. The purpose and intent of this district it to provide for extensive agriculture, while accommodating similar and compatible uses. All other uses are at the discretion of the Development Authority. 40 m (125 ft) from the centre line of municipal roads. Accessory buildings and shelter belts shall be at the discretion of the Development Authority. The purpose and intent of this district is to accommodate a zone of transition from developed urban areas to the surrounding uses, with consideration of the potential impacts on the urban areas. Confined Feeding Operations shall not be permitted within the UF – Urban Fringe District to protect the quality of life of urban residents within the Town of Provost and Villages and Hamlets throughout the M.D. of Provost. Any subdivision or development application surrounding the Town of Provost shall be referred to Map 13 – Airport Vicinity Protection Area to determine if Section 22 Development Near the Airport applies to the application. The purpose and intent of this district is to provide for three (3) or more contiguous country residential parcels. Site Area – 2 acres (0.8 ha). All other uses at the discretion of the Development Authority. 30 m (100 ft) for residential lots in Shorncliffe Estates. 6 m (20 ft), or as required by the Development Authority. Site Area – 5 acres (2.02 ha), or as required by the Development Authority. On Country Residential parcels domestic pets are permitted and one animal unit per acre (rounded to the nearest whole number) shall be permitted in terms of livestock. One animal unit is equal to one mature cow or one mature horse. All other livestock species are at the discretion of the Development Officer. Outdoor storage areas of material and equipment, garbage and waste material, and exterior mechanical equipment shall be screened from adjacent sites and public thoroughfares. in the Municipal Planning Commission’s opinion, the proposed development complies with the amenities of the neighbourhood. PurposeThis land use district is intended to accommodate industrial and business uses not dependent on municipal services (ie: water and sanitary sewer), often requiring larger tracts of land given the need for outdoor storage and/or are more suitably located outside of an urban area due to the nature or a component of the use (e.g. storage/transport of explosives). This land use district is not intended for industrial and business uses that are more appropriately located within the Town of Provost.All uses/developments allowed pursuant to this land use district should have access to well- developed local roads or secondary highways. To not jeopardize the integrity and function of these roads, unless absolutely no alternative exists, access to these parcels shall be by way of shared/dual approaches, an internal road or service road, all to the standards and satisfaction of the road authority having jurisdiction. Airport-related services, offices, buildings training facilities and other related uses. Buildings and uses accessory to extensive agriculture. Production of specialty horticultural crops and honey. Bulk fuel storage and distribution. Blending/sale/distribution of chemical and allied products, fertilizer or animal by-product. Transportation and public utility facilities. Warehousing, storage, receiving or distributing facilities. Industrial manufacturing/processing/ packaging/assembly not requiring municipal services. To determine if the subject land is suitable for and can physically support/sustain the proposed use, subdivision or development in question, the Development or Subdivision Authority may require, before accepting an application as complete, any geotechnical analysis or any other engineering, environmental or technical assessment/information it considers necessary to properly evaluate the application. The Development or Subdivision Authority will ensure that the analysis/assessment/information they require is prepared/substantiated by qualified persons licensed to practice in the Province of Alberta. To the level of detail determined by the Development or Subdivision Authority, applicants shall fully disclose the precise nature and extent of the proposed use, subdivision and/or development, including intended hours of operation, so that their applications can be thoroughly evaluated in accordance with this land use district. In support of an application within this land use district, the Development or Subdivision Authority may require that the applicant undertake, in a manner satisfactory to them, a Conceptual Scheme pursuant to the Act and its Subdivision and Development Regulation. The Conceptual Scheme, which must be undertaken by a qualified person, must be prepared and adopted in accordance with provisions of any statutory plan in effect. In support of an application within this land use district, the Development or Subdivision Authority may undertake, or require that the applicant undertake in a manner satisfactory to them, a polling of the adjacent properties to assist in the comprehensive evaluation of the application. Upon receipt of a completed application, the Development or Subdivision Authority may, prior to making a decision, refer the application to any municipal department or any other external agency for comment and may require a Surveyor’s Certificate or Real Property Report, signed by an Alberta Land Surveyor, relating to any existing/proposed building or other improvement (e.g. sewage disposal system, water well, etc.) that is the subject of the application. Subdivision and development applications within this land use district may be referred to the appropriate urban municipality or adjacent rural municipality for comment prior to a decision by the Subdivision or Development Authority, as the case may be. If an application is referred pursuant to Section 46(3)(f), the decision(s) made with respect to the application(s) referred will take into account the direct and indirect effects of the proposed subdivision or development on the immediate and surrounding areas as well as the future development/subdivision of the adjacent urban or rural municipality as may be outlined in their Municipal Development Plan or Land Use Bylaw. a parcel separated pursuant to the provisions of this Section; in which case the Subdivision or Development Authority may permit a lesser site area. For all other uses not specified in Section 46(4)(a) above, the minimum parcel site area shall be at the discretion of the Subdivision or Development Authority who shall consider the minimum parcel area necessary to accommodate the proposed use. Minimum front and rear yards – the minimum front and rear yard distance shall be 15.0 m (~50.0 ft) from the front or rear yard property line adjacent to an internal subdivision road and 30.0 m (100.0 ft) from the front or rear property line adjoining any Municipal District road, secondary road or highway. Minimum side yard – 10% of parcel width to a maximum of 15.0 m (50.0 ft). The topography of the parcel upon which the building is or is to be situated as well as the topography of immediately adjacent parcels and the surrounding area shall be considered to ensure that the sight lines and view angles of the subject parcel and adjacent parcel are not unduly obstructed by the height of the building. The height of a building shall be in proportion with the principal and accessory buildings on immediately adjacent parcels as well as in keeping with the surrounding area. The fire safety provisions of the Alberta Safety Codes Act and regulations thereto, as may be amended from time to time, and the capacity and availability of fire fighting equipment and personnel. No portion of any building or structure shall exceed the height of the take-off/approach or the transitional surfaces as stipulated on Map 13. All buildings shall not exceed 40.0% of the total site area. any other matters which the Municipal District considers necessary. based on the circumstances of the application before them, and at their sole discretion, either grant their approval, provided the application otherwise complies with this Bylaw and any statutory plan or conceptual scheme in effect, subject to the applicant complying with all applicable provincial and federal as well as any other municipal regulations related to explosives (and submitting proof of same – e.g. a license or certificate, as specified by the Development or Subdivision Authority, that they have complied), or withhold their approval until such time as the applicant demonstrates, to their satisfaction, compliance with all applicable provincial and federal as well as any other municipal regulations related to explosives. revoke an approval in the case where an applicant fails to provide satisfactory proof that all applicable provincial and federal as well as any other municipal regulations related to explosives have been complied with. In the case of new construction, the Development Authority shall require, as a condition of approval, that a Surveyor’s Certificate or Real Property Report, signed by an Alberta Land Surveyor, relating to the building(s) that is (are) the subject of the development permit application, be submitted by the owner/developer upon completion of the building foundation, or siting in the case of mobile and/or portable units on permanent foundations, and prior to commencement of framing or further structural construction to ensure that the building(s) is (are) sited according to the provisions of the development permit and this Bylaw. The Development Authority may stipulate the times of the day or week during which an approved use or development may operate as well as the length of time its approval remains in effect. As a condition of approval, the Development Authority may require that an approved use or development be screened from public thoroughfares and adjacent residential uses by a solid wall, fence or other means in a manner and to a height satisfactory to them. The Development Authority may issue a temporary development permit where the Development Authority is of the opinion that the proposed use is of a temporary nature. The purpose and intent for this district is to provide for residential and recreational development while minimizing the potential for conflict with adjacent and surrounding agricultural uses. Other uses at the discretion of the Development Authority. Lake front lots shall have the greatest dimension towards the lake, or as required by the Development Authority. All dwellings shall utilize a holding tank for private sewage disposal. The installation of such a system shall be approved by a certified Safety Codes Officer. Residential development at Capt. 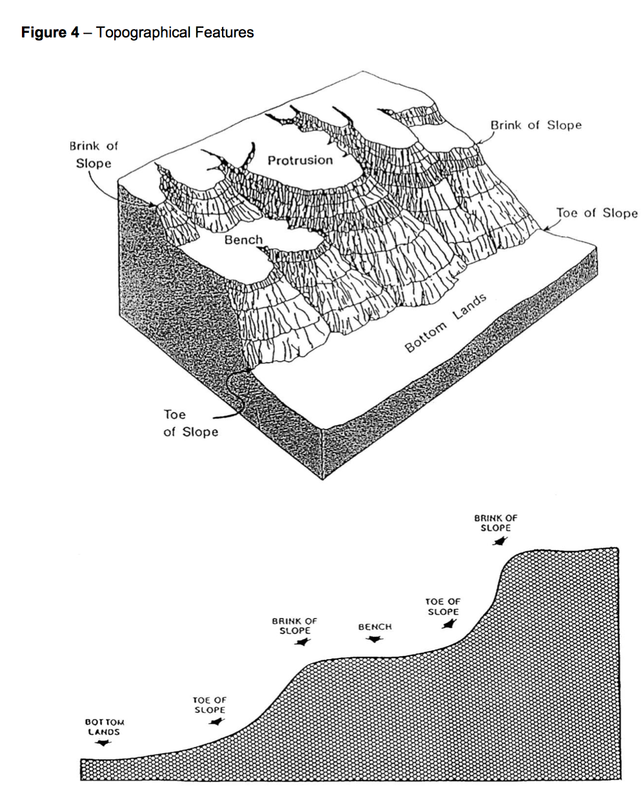 Ayre Lake and Shorncliffe Lake shall be in accordance with the design specifications outlined in Appendix “B”. The Municipality should conduct, or cause to be conducted, water quality testing of permanent water bodies within the “LD” – Lake District to ensure the Alberta Water Quality Guidelines are met for recreational uses. Use of pasture lands for the grazing of livestock should not occur during June to September. In the event that such grazing does take place, there shall be no supplemental feeding of livestock. During the winter months, supplemental feeding of livestock shall not take place on the ice surface of the lake or within 300m (1000 ft.) of the shore of the lake. Stocking rates shall be limited to those numbers that can be grazed during the summer months with no supplemental feeding. Use of the land for livestock grazing or winter feeding shall not exceed five (5) months in a given twelve (12) month period. Livestock shall be kept out of the public beach and campground areas. Upon application for a multiple lot subdivision, Council may require the completion of a satisfactory planning scheme or concept plan. When deciding on applications for a development permit for Multiple Unit Dwellings, the Development Authority should consider the major traffic routes, the existing residential neighbourhood, and the potential for noise generation. The purpose of this district is to provide for a range of commercial uses within Hamlets. Site Area – 230 m2 (2500 sq. ft.), or as required by the Development Authority. Site Width – 7.5 m (25 ft), or as required by the Development Authority. Front Yard – As required by the Development Authority or based on the front yard of neighbouring buildings. Rear Yard – 3 m (10 ft), or as required by the Development Authority. Height – As required by the Development Authority. In deciding on the required minimum requirements, the Development Authority should consider adjacent commercial developments. Parking shall be provided as required by the Development Authority. Sites abutting a residential district shall be screened from view to the satisfaction of the Development Authority. Outdoor storage areas of material and equipment, garbage, and waste material shall be screened from adjacent sites and public thoroughfares, excluding lanes. The purpose and intent of this district is to provide for a range of manufacturing, warehousing, and other industrial land uses within Hamlets. Site Area – As required by the Development Authority. Front Yard – As required by the Development Authority. Side Yard – As required by the Development Authority. Rear Yard – As required by the Development Authority. The purpose and intent of this district is to provide for recreational, educational, and community uses within Hamlets. The purpose and intent of this district is to reserve lands outside of the developed area of hamlets which are intended for future development. This land use district is intended primarily for extensive agricultural use (predominantly pasture/forage), and other rural uses, but from which up to four rural small holding parcels may be subdivided. Subject to the provisions of the Provost Airport Vicinity Protection Area, these rural small holding parcels are intended primarily to provide sufficient land (and separation from neighbors as well as the adjacent urban area) to accommodate a residence, related on-site services, vehicle garage, large shop and/or yard space for those with heavy trucks and other heavy equipment used in the resource sector. in which case the Subdivision or Development Authority may permit a lesser site area. Rural small holding parcel – minimum of 2.0 hectares (5.0 acres), maximum of 8.0 hectares (20.0 acres), unless otherwise specified by the Planning Authority. The ratio of parcel depth to parcel width should not be greater than 2 to 1. For all other uses not specified in Section 55(3)(a) above, the minimum parcel site area shall be at the discretion of the Subdivision or Development Authority who shall consider the minimum parcel area necessary to accommodate the proposed use. Rural small holding uses – maximum of four parcels per quarter sections with the combined area of all four rural small holding parcels within the quarter section not exceeding 16.0 hectares (40.0 acres), unless otherwise specified by the Planning Authority. For all uses, the number of parcels per quarter sections, including any fragmented parcels or remnant parcels, shall together not exceed six parcels unless otherwise specified by the Planning Authority. 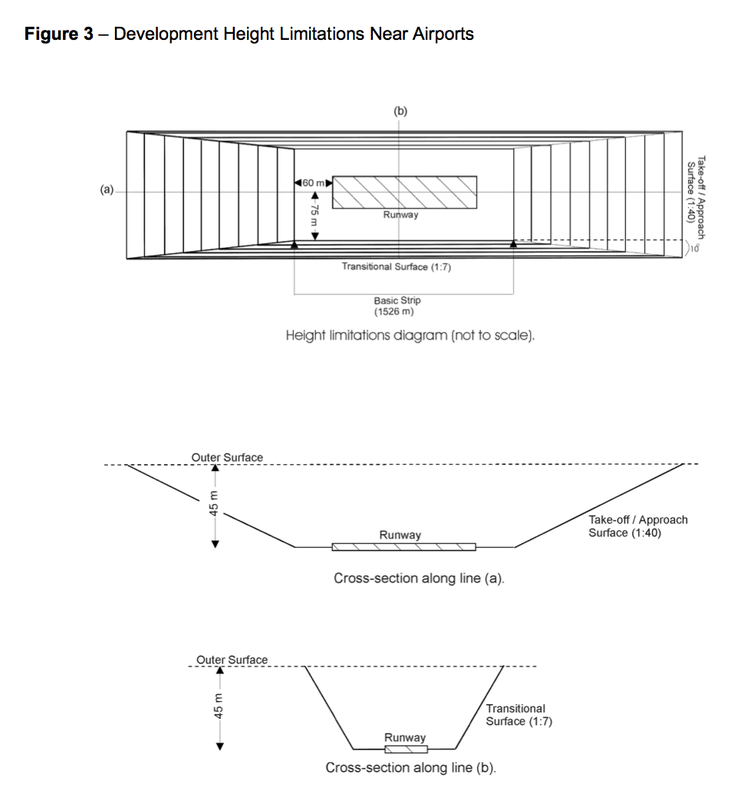 No portion of any building or structure shall exceed the height of the take-off/approach or the transitional surfaces as stipulated in Section 22, Figure 3, and Map 13. The Development Authority shall ensure that such parcels develop in accordance with acceptable design standards and are kept in an orderly and well-maintained state. Rural small holding parcels are not for the purpose of and shall not involve the manufacture, assembly, storage or transportation of explosives. Such parcels should have access to well-developed local roads or secondary highways. Moreover, to not jeopardize the integrity and function of these roads, unless absolutely no alternative exists, access to these parcels shall be by way of shared/dual approaches to the standards and satisfaction of the road authority having jurisdiction. The intensity/extent of heavy truck and equipment storage shall not, in the opinion of the Development Authority, be a source of inconvenience or materially interfere with or affect the use, enjoyment or value of neighbouring parcels by way of excessive noise, odor, dust or refuse matter beyond what would commonly be found in this land use district. The Development Authority may issue temporary or time limited development permit approval with respect to heavy truck and equipment storage. Heavy truck and equipment storage may be reviewed by the Municipal District if complaints are registered by one or more affected landowners. If, at any time, any of the requirements for heavy truck and equipment storage are not complied with, the Development Authority may utilize the remedies available under this Bylaw and the Act. Development permit approval for heavy truck and equipment storage does not exempt compliance with any other applicable municipal/provincial/federal regulations. If an application is referred pursuant to Section 53(7)(d), the decision(s) made with respect to the application(s) referred will take into account the direct and indirect effects of the proposed subdivision or development on the immediate and surrounding areas as well as the future development/subdivision of the adjacent urban or rural municipality as may be outlined in their Municipal Development Plan or Land Use Bylaw. In accordance with Section 641 of the Municipal Government Act, this land use district is to be applied to areas determined by the Municipal District to be unique or of special character or where particular circumstances or difficulties are present. It is intended to ensure that land use and development occurs in these areas in accordance with any applicable provisions prescribed for such areas in a statutory plan in effect or to be put in effect to specifically guide the implementation/administration of this land use district. Pursuant to the relevant sections of the Municipal Government Act and this Bylaw, applications under this district will be received, considered and decided upon by the Council. The Provost Airport and Vicinity Area Structure Plan, hereinafter referred to as the Provost ASP, is an example of a statutory plan put into effect to, among other things, specifically guide the implementation/administration of this land use district. More specifically, on Map 7 of the Provost ASP, the lands within the ASP area bordering Provost Lake are designated “Recreation/Estate Residential” given that this area offers an attractive natural setting around which a comprehensively-planned recreation/estate residential proposal could/ought to be developed. Subject to the provisions of the Provost Airport Vicinity Protection Area (AVPA), this area could lend itself quite well to a residential golf-course development, especially considering the proximity to at least one urban service (sanitary sewer). It could also nicely complement the existing and future land uses immediately to the north, inside the Town of Provost. This land use district, then, constitutes the mechanism in the Land Use Bylaw by which Council can make the best use of this amenity area and help to shape it in accordance with sound planning principles. As prescribed by Council in accordance with Section 54(1) above. 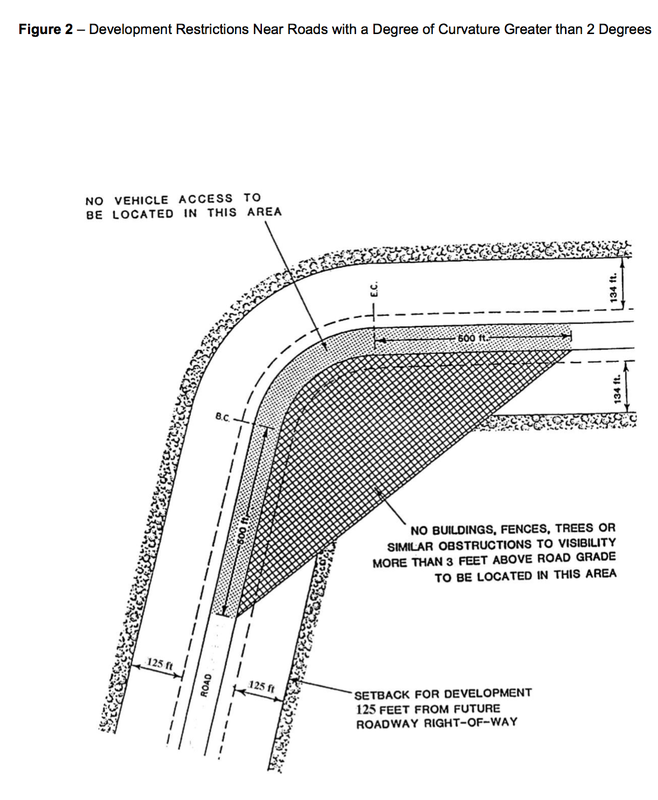 To determine if the subject land is suitable for and can physically support/sustain the proposed use, subdivision or development in question, Council may require, before accepting an application as complete, any geotechnical analysis or any other engineering, environmental or technical assessment/information it considers necessary to properly evaluate the application. Council will ensure that the analysis/assessment/information they require is prepared/substantiated by qualified persons licensed to practice in the Province of Alberta. To the level of detail determined by Council, applicants shall fully disclose the precise nature and extent of the proposed use, subdivision and/or development, including intended hours of operation, so that theirapplications can be thoroughly evaluated in accordance with this land use district. In support of an application within this land use district, Council may undertake, or require that the applicant undertake in a manner satisfactory to them, a Conceptual Scheme pursuant to the Act and its Subdivision and Development Regulation. The Conceptual Scheme, which must be undertaken by a qualified person, must be prepared and adopted in accordance with provisions of any statutory plan in effect. In support of an application within this land use district, Council may undertake, or require that the applicant undertake in a manner satisfactory to them, a polling of the adjacent properties to assist in the comprehensive evaluation of the application. Upon receipt of a completed application pursuant to a direct control district, the Council may, prior to making a decision, refer the application to the Development Officer, the Municipal Planning Commission, any municipal department or any other external agency for comment and may require a Surveyor’s Certificate or Real Property Report, signed by an Alberta Land Surveyor, relating to the building(s) that is (are) the subject of the development permit application. The Council, in considering a subdivision or development permit application referred pursuant to Section 57(4)(a), will consider but shall not be bound by the comments it receives. At some point, as determined by Council, prior to deciding upon the application before it, the Council will provide public notice, through means and to whom it considers necessary, that a decision regarding an application pursuant to a direct control district is to be made, that an opportunity will be afforded to any interested person to make representation on the application and that Council shall take into account any such representations made when giving final consideration to the said application. Applications within this land use district may be referred to the appropriate urban municipality or adjacent rural municipality for comment prior to a decision by Council. If an application is referred pursuant to Section 54(4)(d), the decision(s) made with respect to the application(s) referred will take into account the direct and indirect effects of the proposed subdivision or development on the immediate and surrounding areas as well as the future development/subdivision of the adjacent urban or rural municipality as may be outlined in their Municipal Development Plan or Land Use Bylaw. shall comply with the Municipal Government Act, Subdivision and Development Regulation, any AVPA as well as any statutory plan and/or Conceptual Scheme in effect specifically for the purpose of directing the implementation/administration of this land use district. All parcel regulations shall be as determined by the Council who, in determining such regulations, shall consider all information it obtains pursuant to the provisions of this land use district and comply with any applicable provisions of any statutory plan or Conceptual Scheme in effect. No activity may be undertaken that would, in the opinion of Council, unduly interfere with the amenities or materially interfere with or affect the use, enjoyment or value of neighbouring properties by reason of excessive noise, smoke, steam, odor, glare, dust, vibration, refuse matter or other noxious emissions or containment of hazardous materials. The design, external finish, architectural appearance, siting, landscaping, screening and buffering of any building(s) or structure(s) shall be to the satisfaction of Council so that there shall be general conformity in such matters with respect to adjacent buildings, adequate protection afforded to the amenities of the adjacent residential properties and any objectionable aspects or potential incompatibility with other uses and developments in adjacent land use districts is or can be minimized. The Council may approve, with or without conditions, or refuse the application, giving reasons for the refusal. revoke an approval in the case where satisfactory arrangements have not been made by a developer for the supply of water, sewerage and roadaccess, or any of them, including payment of the costs of installing or constructing any such utility by the developer. In the case of new construction, the Council shall require, as a condition of approval, that a Surveyor’s Certificate or Real Property Report, signed by an Alberta Land Surveyor, relating to the building(s) that is (are) the subject of the development permit application, be submitted by the owner/developer upon completion of the building foundation, or sitting in the case of mobile and/or portable units on permanent foundations, and prior to commencement of framing or further structural construction to ensure that the building(s) is (are) sited according to the provisions of the development permit and this Bylaw. The Council may stipulate the times of the day or week during which an approved use or development may operate as well as the length of time its approval remains in effect. As a condition of approval, Council may require that an approved use or development be screened from public thoroughfares and adjacent residential uses by a solid wall, fence or other means in a manner and to a height satisfactory to them. The Council may issue a temporary development permit where the Council is of the opinion that the proposed use is of a temporary nature. Upon review of any subdivision application the subdivision authority shall take into consideration the relevant setbacks and requirements for any WECS applications in process, approved or developed in the district. General Purpose and IntentThis land use district is intended specifically to provide for land use(s), subdivision(s) and development(s) in accordance with and as specified in the Rosyth Area Structure Plan (ASP), being Bylaw No. 2200, and any amendments thereto. The R(ASP)DC – District applies to all lands within the Rosyth ASP as depicted in Figure 2 on Page 7 of the Rosyth ASP. Figure 2 is also attached to and forms part of this land use district – shown after the definitions contained in Section 55. (2) below.The purpose of the Rosyth ASP is to create a municipal planning policy and regulatory framework under which the large-scale storage and transmission of petroleum and associated materials within the Plan Area can continue to operate, develop and expand over the long term unobstructed by adjacent land uses and under which compatible adjacent land uses can continue to develop and operate over the long term unimpeded by the storage and transmission of petroleum and associated materials.Section 55., in tandem with the Rosyth ASP on which it is based, provides the ways and means necessary to ensure that the future use, subdivision and development of the subject lands occurs in a planned manner and that the processing of subsequent subdivision and development permit applications can be carried out with efficiency and clarity. Council, at their discretion, who may delegate their discretion to the Development Authority, may allow for the uses, subdivision and development provided for the lands within the Rosyth ASP. provided for the guest;“BOARDING/LODGING” – means a use accessory to a dwelling in which the owner lives and supplies sleeping unit accommodation, for remuneration, for not more than two (2) residents to whom they are not related. It may or may not include meal service;“CAMPGROUND” – means a development for the purpose of providing short term accommodation for recreational vehicles or tents. A campground is not to be construed as development for the purpose of accommodating long term or permanent occupancy. Related facilities that are accessory to and support the campground, such as an administrative office, laundromat, picnic area and playground may be included on-site. “DWELLING, SINGLE DETACHED” – means a dwelling constructed on site upon on a permanent foundation and/or basement. OUTDOOR STORAGE” – means a development where, in the opinion of the Development Authority, goods, materials, or equipment are or may be place outside of a building but does not involve salvaging. Typical uses include but are not limited to pipe yards or vehicle or heavy equipment storage compounds. OWNER-OPERATOR HEAVY VEHICLE AND EQUIPMENT STORAGE/PARKING” – means the outdoor on-site storage/parking of heavy vehicles (e.g. tractor-trailer unit, flatbed, grain truck, tanker, and so forth) and equipment (e.g. back/track hoe, grader, earth-moving equipment, and so forth) owned and operated by a resident landowner including any family members of the resident landowner also resident on-site. “VETERINARY SERVICE” – means development used for the care and treatment of animals where the service primarily involves in-patient care and major medical procedures involving hospitalization for periods of time. This use includes animal hospitals, animal shelters, and animal crematoriums. Section 55. (3) applies to the lands within the “Terminal Area – Existing Development and Foreseeable Expansion” designation in Figure 2 on Page 7 of the Rosyth Area Structure Plan, being Bylaw 2200, and amendments thereto and shown under Subsection (2) of this district.Permitted UsesAccessory building. All uses and development over which the Municipal District has jurisdiction and lawfully in existence on parcels existing at the time this land use district was assigned and came into effect. Owner-operator heavy vehicle and equipment storage/parking. Those uses which, in the opinion of the Development Authority or Subdivision Authority, are similar to the permitted or discretionary uses, and which conform to the general purpose and intent of this land use district and the Rosyth Area Structure Plan upon which it is based. Section 55. (4) applies to the lands within the “Potential Terminal Expansion Area” designation in Figure 2 on Page 7 of the Rosyth Area Structure Plan, being Bylaw 2200, and amendments thereto and shown under Subsection (2) of this district.Permitted UsesAccessory building. thereto and shown under Subsection (2) of this district.Permitted UsesAccessory building. was assigned and came into effect. Plan upon which it is based. Section 55. (6) applies to the lands within the “Agriculture – Reserve” designation in Figure 2 on Page 7 of the Rosyth Area Structure Plan, being Bylaw 2200, and amendments thereto and shown under Subsection (2) of this district.Permitted UsesAccessory building. Bed and breakfast operation, minor. In accordance with the Rosyth ASP, for the lands within the “Terminal Area – Existing Development and Foreseeable Expansion and “Potential Terminal Expansion Area” designations, no dwellings shall be approved in addition to those which lawfully existed at the time the Rosyth ASP and this land use district came into effect shall be allowed. The only residential subdivision that will be considered shall be to encompass a dwelling lawfully in existence at the time the Rosyth ASP and this land use district came into effect. Note that such residential subdivision will not allow a dwelling to be developed on the remainder of the titled area being subdivided. In accordance with the Rosyth ASP, for the lands within the “Agriculture-Reserve” designation, one dwelling in addition to that which lawfully existed at the time the Rosyth ASP and this land use district came into effect shall be a discretionary use with any approval directing such development as far away as is reasonably possible away from the lands within the “Terminal Area – Existing Development and Foreseeable Expansion” and “Potential Terminal Expansion Area” designations. Residential subdivision shall be limited to a maximum of one residential lot per unsubdivided quarter section provided the subdivision encompasses a lawfully approved dwelling in existence prior to the residential subdivision application being accepted in its complete form (ie: no undeveloped residential lot/subdivision shall be allowed). Note that such residential subdivision would not necessarily allow a dwelling to be developed on the remainder of the titled area being subdivided. Notwithstanding any of the foregoing, no more than two dwellings shall be allowed to exist per quarters section within the “Agriculture-Reserve” designation. In accordance with the Rosyth ASP, for the lands within the “Agriculture/Conservation” designation, any dwelling lawfully in existence at the time the Rosyth ASP and this land use district came into effect shall be considered a permitted use meaning that it can be added to, rebuilt, replaced, etc. Where there is no dwelling present on a lot that existed at the time the Rosyth ASP and MDP/LUB amendments came into effect, the Development Authority may, on a discretionary basis, approve a dwelling taking into consideration the topography of the site, the provision of public road access to the dwelling and that such a dwelling should be sited as far away as is reasonably possible away from the lands within the “Terminal Area – Existing Development and Foreseeable Expansion” and “Potential Terminal Expansion Area” designations. Residential subdivision shall be limited to a maximum of one residential lot per unsubdivided quarter section provided the subdivision encompasses a lawfully approved dwelling in existence prior to the residential subdivision application being accepted in its complete form (ie: no undeveloped residential lot/subdivision shall be allowed). Note that such residential subdivision would not allow a dwelling to be developed on the remainder of the titled area being subdivided. Notwithstanding any of the foregoing, no more than one dwelling shall be allowed to exist per quarter within the “Agriculture-Conservation” designation. Minimum Site AreaUnless otherwise prescribed in this Bylaw, the minimum site area shall be as determined by the Subdivision or Development Authority, as the case may be, who shall take into account the general purpose and intent of this land use district, the location and setbacks of adjacent land uses and buildings as well as the other site provisions of this land use district. Minimum front yard – the minimum front yard distance shall be 41.0 m (~134.5 ft) from the front yard property line. Minimum side and rear yard – the minimum side and rear yard distances shall be 15.0 m (~49.25 ft) from the side and rear yard property lines, respectively, except where the side or rear yard is adjacent to a road in which case the minimum distance shall be 41.0 m (~134.5 ft) from the side and rear yard property lines, respectively. Design, Character and Appearance of BuildingsThe design, siting, external finish, architectural appearance and landscaping generally, of all buildings, including any accessory buildings or structures and signs, and any reconstruction, shall all be to the satisfaction of the Development Authority, so there is conformity with adjacent buildings, and adequate protection afforded to the amenities of adjacent properties. As a condition of a development permit, the Development Authority may require a letter of guarantee or an irrevocable letter of credit in order to secure compliance with any requirements imposed. No activity may be undertaken that would, in the opinion of the Development Authority, unduly interfere with the amenities or materially interfere with or affect the use, enjoyment or value of neighbouring properties by reason of excessive noise, smoke, steam, odour, glare, dust, vibration, refuse matter or other noxious emissions or containment of hazardous materials. To determine if the subject land is suitable for and can physically support/sustain the proposed use or development in question, the Development Authority may require, before accepting an application as complete, any geotechnical analysis or any other engineering, environmental or technical assessment/information it considers necessary to properly evaluate the application. The Development Authority will ensure that the analysis/assessment/information they require is prepared/substantiated by qualified persons licensed to practice in the Province of Alberta. To the level of detail determined by the Development Authority, applicants shall fully disclose the precise nature and extent of the proposed use, subdivision and/or development, including intended hours of operation, so that their applications can be thoroughly evaluated in accordance with this land use district. Upon receipt of a completed application, the Development Authority may, prior to making a decision, refer the application to any municipal department or any other external agency for comment and may require a Surveyor’s Certificate or Real Property Report, signed by an Alberta Land Surveyor, relating to any existing/proposed building or other improvement that is the subject of the application. revoke an approval in the case where satisfactory arrangements have not been made by a developer for the supply of water, disposal of sewage and road access, or any of them. In the case of new construction, the Development Authority shall require, as a condition of approval, that a Surveyor’s Certificate or Real Property Report, signed by an Alberta Land Surveyor, relating to the building(s) that is (are) the subject of the development permit application, be submitted by the owner/developer upon completion of the building foundation and prior to commencement of framing or further structural construction to ensure that the building(s) is (are) sited according to the provisions of the development permit and any other relevant provisions of the Bylaw. no heavy vehicles or equipment shall be stored or parked on-site other than those owned and operated by the resident landowner including any family members of the resident landowner also resident on-site. all heavy vehicles or equipment stored/parked on-site shall be stored parked outside and in a neat and orderly fashion. the development authority, at their discretion and to their satisfaction, may require that an area used for the outside storage/parking of heavy vehicles and equipment be screened from view. based on the circumstances of the application before them, and at their sole discretion, either grant their approval, provided the application otherwise complies with this Plan or any conceptual scheme in effect, the Municipal Development Plan and the Land Use Bylaw, subject to the applicant complying with all applicable provincial and federal as well as any other municipal regulations related to explosives or radioactive material (and submitting proof of same – e.g. a license or certificate, as specified by the Development or Subdivision Authority, that they have complied), or withhold their approval until such time as the applicant demonstrates, to their satisfaction, compliance with all applicable provincial and federal as well as any other municipal regulations related to explosives or radioactive material. If at any time, in the opinion of Development Authority, any of the provisions of this land use district have not been complied with, the Development Authority may utilize the enforcement mechanisms available under the Municipal Government Act. any other information deemed necessary by the Development Authority. Minimum Specifications for Residential Development in Lake DistrictsFOUNDATION To be of concrete, mortared brick, stone, treated wood, or cement block construction, either continuous footing or sufficient pillar support. FLOOR JOISTS When floor joists are used, refer to the following table which indicates the maximum clear span for floor joists single bridging. 12″o.c. 16″o.c. 20″o.c. 24″o.c. 12″o.c. 16″o.c. 20″o.c. 24″o.c. FLOOR SPACE A minimum of 300 square feet exclusive of verandah area. WALL FRAMING Minimum studding – 2″ x 4″ x 8′ – 16″o.c. ROOF Gable or cottage type only, unless permission is obtained from the Municipality to construct a building having a sloped or flat roof. To be finished with either asphalt or cedar shingles or metal roofing (rolled asphalt roofing on Municipally- approved flat roof only). CHIMNEY Either brick, cement block, selkirk, or such other type of chimney approved by the Municipality. To be 2′ from all woodwork for fire protection and prevention. Spark arrestors are to be installed. DOORS Each cabin or cottage shall contain a front and rear entrance for reasons of health and fire protection, unless the building is specifically designed where a side entrance only will suffice. EXTERIOR FINISH To be of some recognized building siding, either manufactured wood material, metal, or asphalt. In the case of wood, product is to be painted or varnished. PLANS One copy of the floor plan, on a proper application form, showing all dimensions must be filed with the Municipality, and construction must not start until the plan has been approved. It is the policy of the M.D. of Provost No. 52 under Bylaw 764 to circulate the Provost News in which the M.D. 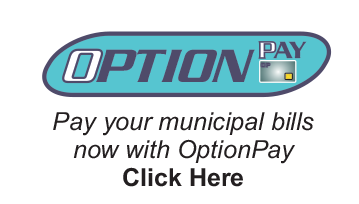 reports to all ratepayers who do not already subscribe. Those wishing to receive the Provost News must complete the form and return it to the M.D. office. Original layout and design by Reid Signs Ltd.